Now you can be a “Dirty Jew” even if you are not Jewish! You are here: Home / Antisemitism / Now you can be a “Dirty Jew” even if you are not Jewish! It was about a year ago that a café in Belgium posted a sign on its window stating that dogs were allowed inside but Jews weren’t. The sign didn’t stay on the window for very long as the outrage of several Jewish organizations was quickly demonstrated and the police was dispatched on the scene to take the sign down. They might have pulled the message away from the public, but they certainly didn’t change the mindset of the café owner. It was only a few days before that incident that another store in Belgium decided for a short time that they wouldn’t sell merchandise to Jews. Similarly, the police came to that store to question the owner about their strange decision. 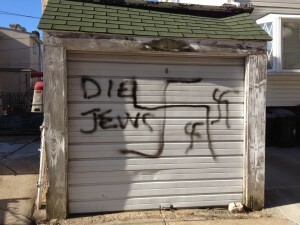 The owner swore that this wasn’t true and that in fact they had many Jewish customers. While it is again very hard to prove that they indeed chose not to sell to a Jewish woman, the behavior was symptomatic of serious problem. What is probably the most puzzling and disturbing aspect of Galliano’s and Gersh’s diatribes is that they were both directed at people who were not Jewish. This has to be the epitome of irrational hatred when you become verbally and/or physically abusive to someone you believe to be Jewish who in fact isn’t. This also should make decent people realize that we could now all become targets of anti-Semitism simply because of someone’s preconceived idea that could potentially lead them to abuse and violence. This could be a game changer! Maybe this unfortunate twist in the way anti-Semitism is expressed and/or carried out is what is needed for people to speak-up. After all, there’s no better way to fight a monster than when it is in your own backyard threatening to devour your entire family. I used to say that “Anti-Semitism is hatred of the Jewish people characterized by destructive thoughts, words and/or actions against them.” I still believe that! Additionally, anti-Semitism goes further as it is the only kind of hatred that includes contempt for the people, the land and the law. All aspects of Jewish life, customs and culture, along with the Jewish homeland are not exempt from the vitriol of anti-Semitism. But today, it is no longer any act or behavior connected to Jewishness or Judaism that puts you at risk. You are at risk if you support Israel and the Jewish people or if you speak-up against pro-Palestinians or BDS proponents. Basically, you are also at risk if the person dispensing the vitriol of anti-Semitism decides that you are “Jewish enough” to deserve such a treatment. This makes absolutely no sense at all! During the Middle Ages, the image of the Jew had been brought down to the lowest possible level as Jewish people were described as blood drinking devils with a stench. No wonder the masses saw it their obligation to rid medieval Europe of such a malevolent group of people. That trend has resurfaced globally and for the most part people are either drinking the proverbial Kool Aid or at the very least serving it to their community. Most of the Church Fathers and Luther “theologized” anti-Semitism. 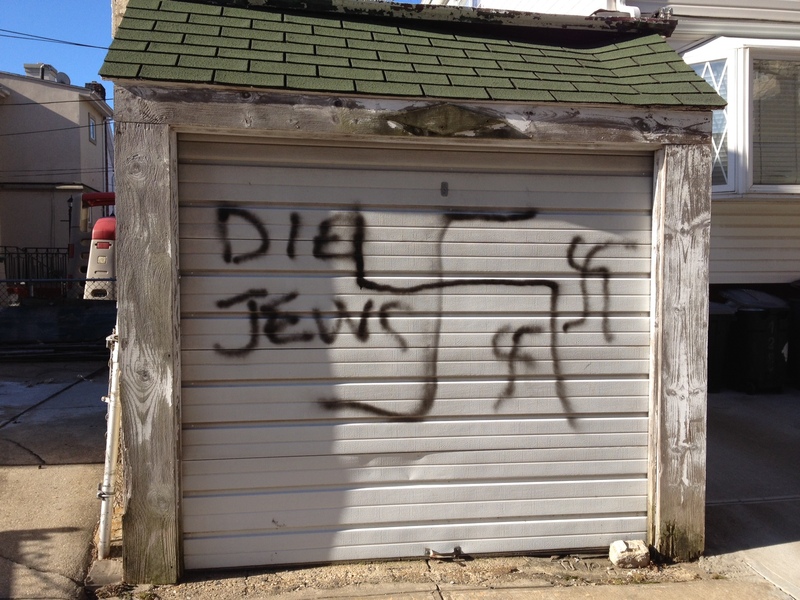 Will our post-modern world “normalize” anti-Semitism? In today’s world, you don’t even have to be Jewish to be a “dirty Jew”. And all this time I thought that we–the Jews– were special! I’ll share that title gladly with my Jewish brothers & sisters. They won’t stand alone. The world is recycling the old ideas, because it can’t stand the truth. Hatred doesn’t need much motivation to rear it’s old head. Just “because” is enough when you don’t want to have to really think about your actions. As shown by this EU official, words weren’t enough so he had to turn physical. The saying: “Sticks and stones may break my bones, but words will never hurt me” is the cause of much distress because some people just want to hurt others. As a gentile believer in Jesus, I stand in solidarity with Jewish people and Israel. The Bible is clear that in the last days (all nations) will turn against Israel. (True) Christians will never abandon Israel and the Jewish people. 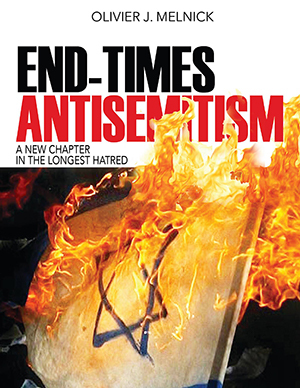 The rampant antisemitism building around the globe is no surprise…wicked and evil to the core. God’s promise in Genesis 12:3 remains unchanged. I am in agreement with Howard Green’s comment with the possible exception of his comment about all true Christian’s standing with Israel and the Jewish people in these last days. Many born again Christians seem not to be able to connect the dots on these types of issues. This does not cause me to doubt whether they are truly born again but I do certainly question their spiritual discernment in relation to end time events as outlined in the Old and New Testaments. I am not Jewish but have Jewish relatives. If I was a young man, knowing what I know now, I would be proud to be a gentile soldier in IDF but, alas, I am too old. I know people who claim to be only anti-Israel but after a few drinks forget themselves and rant about Jews. I wish my my state broadcasting network, the BBC, would report on Israel fairly but I won’t hold my breath! I love to know when jewish people become the Messiah Jesus’ believers, I love when they speak about Jesus love, I read in hadavar.org and jewsforjesus.org of the loved you share to our Lord and His ministry of salvation to the humankind. I also realize the struggle revealed in galatians 4:21-29, specifically galatians 4:29 predicts that one of the children of Abraham Avinu will persecute the other. I have receive personally severe threats of some jews against my life by quoting deuteronomy 13 against our preaching, just for trying to show them the love of our God, Lord of Abraham, Isaac and Jacob, they resort to a supposedly noahide law that it is their offering for not jewish people who wants to draw near to jewish faith. They make threats against both christian people and the now so-called judeo-messianic lifes only for believing in Christ, some of them even have uttered openly their wish to start destroying churchs, they make false accusations of hatred and persecution and antisemitism and ascribe sin of murder against christian people only for spreading the Word of God, the Gospel of Our Lord and Savior Son, Son of David, Son of Abraham. the truth is that I perceive great hostility of the so-called jews against Christianity and it is clearley demostrated with their words. I love Hadavar.org and Jewsforjesus ministry and I like to know clearly what do you think of what I have told in this written, and also I like to know what do you think about the so-called holocaust.